Arm every member of your infection prevention team with a safe and effective environment protection solution. Treat any room in your facility with a system proven to kill disease-causing pathogens, including the most difficult to kill, C. diff spores. 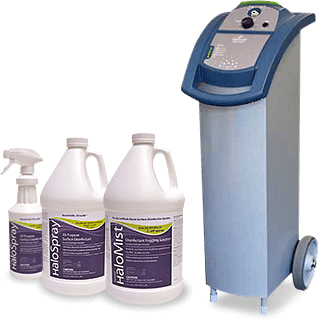 The Halo Disinfection System combines a choice of two patented hydrogen peroxide-based disinfectants for use with the dry-mist dispensing HaloFogger® as an easy-to-use and affordable surface disinfection system. Unlike ineffective “spray & wipe” and UV disinfection technologies, the Halo Disinfection System delivers hands-free, whole room surface disinfection at a 6-log kill rate that saves patients’ lives. This hands-free solution is a family of unique products designed to deliver infection-rate reducing results safely at a cost lower. Room fogging is proven to be the most thorough and cost-effective method for treating all the exposed surfaces within a room while reducing the labor and skills required to perform an effective treatment, and it is safe for use with sensitive electronic equipment. The Halo Disinfection System reaches into nooks, crevices, and corners that disinfecting sprays & wipes can’t, reaching every exposed surface in a room, not just the primary or “high-touch” surfaces, and reducing the risk of cross-contamination associated with using a rag, wipe or sponge. EPA registered disinfecting fogging formula for whole room disinfection. Broad-spectrum disinfection formula kills bacteria and viruses on hard, non-porous surfaces that you come into contact with everyday. Thoroughly deliver dry-mist of concentrated Halomist™ Disinfectant to every exposed surface within a room.